"...big, jangling guitars, engaging lyrics and harmonies from heaven..."
"...crammed with the kind of cross-Atlantic, post-Beatles pop best personified by Squeeze and Teenage Fan Club... quintessential Englishness..."
Third Solo Lp in 22 Years!! 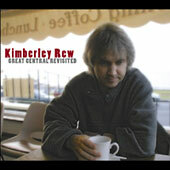 Kimberley Rew is the lead guitarist for The Soft Boys (new CD coming this fall) & the writer of "Walking On Sunshine" with his other group Katrina & The Waves. Robyn Hitchcock: Robyn Hitchcock founded and led the legendary Soft Boys which Rew joined in 1978. Hitchcock moved on to become an established cult artist, solo and with the Egyptians. The Soft Boys reunited to rerelease their Underwater Moonlight album and record a new album in 2001. Dave Mattacks: drummer Dave Mattacks joined England's premier folk-rock band Fairport Convention in1969 and has since worked with Richard Thompson, Steeleye Span, Nick Drake, XTC, Joan Armatrading, Mary Chapin Carpenter and on innumerable sessions. Rew and Mattacks met in Ashley Hutchings' All Stars in 1988. Vince de la Cruz: bassist Vince de la Cruz is like Rew an original member of Katrina and the Waves, formed in 1981 and noted for the evergreen summer hit Walking on Sunshine. Patch Hannan: drummer Patch Hannan was a member of the Sundays before starting his own production company, and has also worked with Robyn Hitchcock and Katrina. Julian Dawson: Julian Dawson has had a long musical career solo and with members of cult band Can, plus occasional contributions from and duo appearances with Rew. Andy Metcalfe: Andy Metcalfe is an original Soft Boy as well as co-producer of Rew's first album. He joined Squeeze in 1985. Lee Cave-Berry: bassist and singer Lee Cave-Berry worked with many bands in the UK and Europe before teaming up with Rew for several recording and live projects. Tom Dalpra: singer Tom Dalpra has worked with Cambridge, England legends Nutmeg and the Lonely. Mixed by Pat Collier: mixer Pat Collier formed punk band the Vibrators in 1976, then one of the first power-pop bands, the Boyfriends, before moving on to produce the Wonderstuff, Darling Buds, Soft Boys, Robyn Hitchcock, Katrina and the Waves and many others. Engineered by Steve Stewart: recording engineer Steve Stewart was a founder and long-term member of progressive band the Enid.